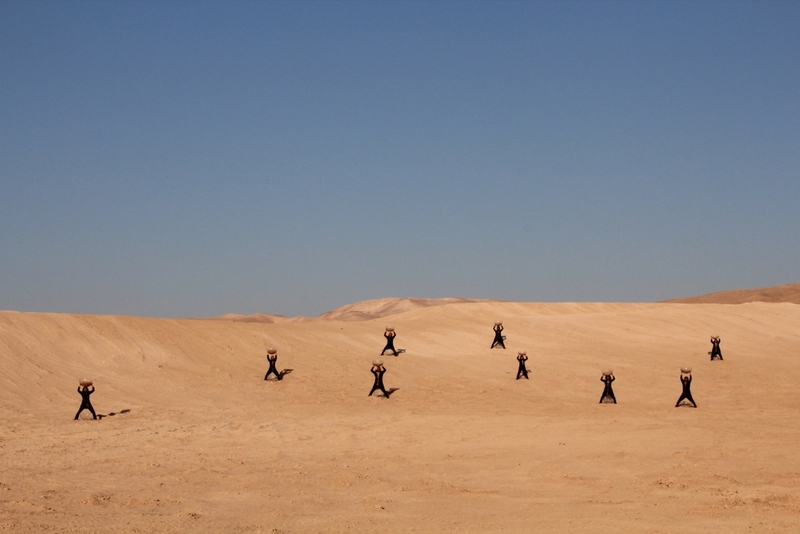 The video "Sand Clock“ is related to the landscape, to cultural and social aspects as well as to time, change and bodywork. Both artists appear in the video as part of a group consisting of 10 performers of different age, culture and religious background to perform together in this video. The artists stand in the dessert like sculptures. All of them try to be a human sand clock. This means that the performers are carrying a transparent bowl above their heads, which is filled with sand. The sand is flowing from above down through a whole onto their bodies towards a lower bowl on the ground, in which the performers stand. The actors are holding the heavy bowls with the sand sliding down in front of their faces. Meantime the real time is passing as well. The Group of performers consisting of young's, adults, middle agers and old people are standing for the passing time. In a poetic way, one can say, that the performers stand for the process of life: being born, living and dying. As well, in the video an art relict is produced with the bowls on the ground, which are filled with sand, floating from the top during the performance. The sand filled bowls, standing in the real desert after the performance, can be seen as small versions of deserts itself and resemble in this way absurd artefacts. The desert is copied and duplicated in a virtual sense. Our understanding of the desert as a relic of time is materialized somehow: The video starts in the desert, and ends so to say as a desert.